But when he saw the wind boisterous, he was afraid; and beginning to sink, he cried, saying, Lord, save me (Matthew 14:30). 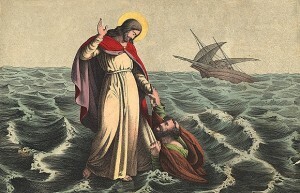 Today we had offered for our attention the wondrous and for us very precious account from the Gospel of the Lord’s miraculous walking on the sea and of His deliverance of His disciples, who were perishing in the waves of the sea, and of the Apostle Peter, who was trying to walk over the waves. After the miraculous feeding of the five thousand people with five loaves and two fishes, the Evangelist Matthew relates: And straightway Jesus constrained His disciples to get into a ship, and to go before Him unto the other side, while He sent the multitudes away. And when He had sent the multitudes away, He went up into a mountain apart to pray: and when the evening was come, He was there alone. But the ship was now in the midst of the sea, tossed with waves: for the wind was contrary. And in the fourth watch of the night Jesus went unto them, walking on the sea. And when the disciples saw Him walking on the sea, they were troubled, saying, “It is a spirit”; and they cried out for fear. But straightaway Jesus spoke unto them, saying, “Be of good cheer: it is I, be not afraid.” And Peter answered Him and said, “Lord, if it be Thou, bid me come unto Thee on the water.” And He said, “Come.” And when Peter was come down out of the ship, he walked on the water, to go to Jesus. But when he saw the wind boisterous, he was afraid: and beginning to sink, he cried, saying, “Lord, save me.” And immediately Jesus stretched forth His hand, and caught him, and said unto him, “O thou of little faith, wherefore didst thou doubt?” And when they were come into the ship, the wind ceased. Then they that were in the ship came and worshipped Him, saying, “Of a truth Thou art the Son of God.” And when they were gone over, they came into the land of Gennesaret (Matthew 14:22-34). Brothers and sisters, everything that we heard here is exactly applicable to us, who are perishing and drowning in the waves of the sea of life. Our earthly life, my dear ones, bears a great resemblance to the sea, for which reason it is called the “sea of life” in the Church’s hymnography. Just as the sea is calm in times of quiet, without waves and with a smooth and bright surface, so too does our life, where there are no adversities and misfortunes, flow along quietly, calmly, and pleasantly. But then the winds blows, the waves swell, and the sea surges, ready to sink not only a small boat, but even a large ship. It is the same in our life. Adversities and misery arise, passions surge, temptations and allurements appear, and sin runs amuck. Then life loses its calmness and evenness, departing from its usual track and threatening to destroy the inexperienced person who is unsteady in the rules of Christianity. In this manner, today’s Gospel teaches us about the benefit and necessity of solitary prayer. The Lord Jesus Christ Himself often prayed in solitude. In solitude one can give oneself wholly over to prayer, because then nothing and no one will hinder one; whereas, when one is among people, their bustling about makes giving oneself wholly over to prayer impossible for the majority of people. 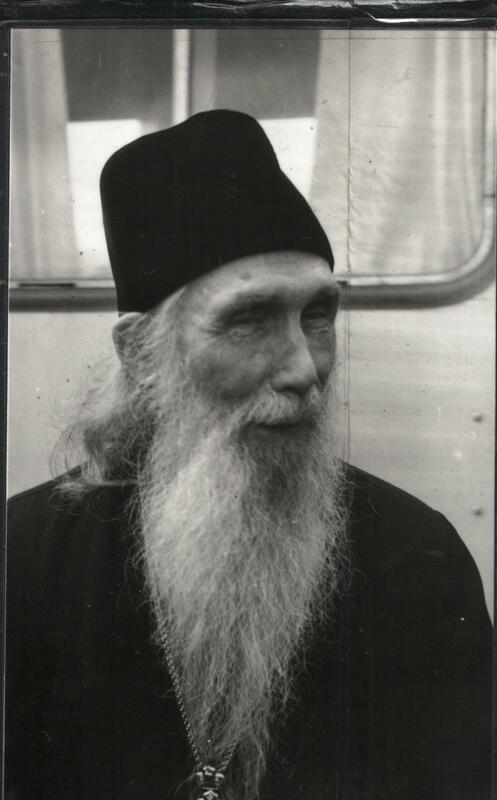 This is possible only for experienced ascetic strugglers, who have learned to converse with God everywhere and in all places. We can, of course, find ourselves in the same situation as the Holy Apostles. In our lives we can experience many terrible afflictions and sorrows, and it can then seem to our confused heart that the Lord God has forsaken and forgotten us; that we are completely perishing; and that there is neither help nor salvation for us from anywhere. But be bold, dear brothers and sisters, in these terrible times and fear not; place your trust in the Lord, and not in the sons of men (Psalm 145:3). Do not forget for a single minute that Divine miracle about which you heard in today’s Gospel. May this manifestation of the Savior’s Divine love constantly serve as encouragement and support for us during our course through the sea of life! If we look at man’s earthly life, we see that it is full of sorrows and all manner of vicissitudes from his birth and very earliest years all the way to his last breath. Human life – both in its outward and especially in its inward aspects – cannot always remain in the same circumstances and conditions. A constant change of events takes place, with one situation replacing another. At times man is content, calm, and happy, while at other times he is overtaken by failure, troubles, and unhappiness. Today man is rich, while tomorrow he is poor; today he and everyone else is healthy, while tomorrow someone succumbs to a fatal illness. Today man is respected and revered, while tomorrow he is dishonored and humiliated. As such, all of man’s life is full of vicissitudes. Many different afflictions befall man; they are beyond number. And all of them are sent for a good purpose, for our benefit. Just as the Lord allowed a contrary wind in order to strengthen them in faith, courage, and fearlessness in enduring adversities, so too should we believe that the right hand of God providentially allows these adversities for our correction. 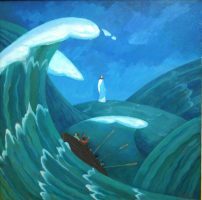 The Lord allows these stormy waves and for us to fall into tribulations in order to strengthen us in virtues; He sends misfortunes to humble our pride and self-love, to restrain our whims, and not to allow us to fall into spiritual laxity; and, most importantly, He gives us to understand that we should seek true blessedness not on earth, but rather in the Heavens. All things work together for good to them that love God (Romans 8:28), for which reason we should magnanimously endure everything sent from the hand of God. Not to be sorrowful amidst sorrows is impossible because we are human, but the sorrows themselves should be dissolved by good hope, for we are not without God. At evening shall weeping find lodging, but in the morning rejoicing (Psalm 29:6). And they that sow with tears shall reap with rejoicing (Psalm 125:5). But, apart from external upheavals, man also experiences internal upheavals. Changes occur much more often in the inner, emotional, spiritual-moral state than they do in external life. Here there are even more storms and disturbances ready to destroy one. Our inward condition can change every minute. Thoughts, feelings, and desires constantly replace one another, so that we often cannot remain in any one of them for long. Ludicrous thoughts, indecent feelings, and filthy desires often appear in one’s soul – and this all takes place apart from our own will. Inner passions and predilections torment us, drawing us towards sin – and hence to perdition. This warfare is often extremely difficult; we feel an inner dichotomy, a battle between spirit and flesh. The spirit directs our desires to celestial beauty, showing us the path to virtue, while fleshly inclinations relegate us to the earth, enticing us with the pleasantness of sensual pleasures and destroying our good desires and intentions. Here is what the Apostle Paul says concerning this: I delight in the law of God after the inward man: But I see another law in my members, warring against the law of my mind, and bringing me into captivity to the law of sin which is in my members (Romans 7:22-23). In my spirit I love an undefiled life, but there is something tyrannical in me that does not permit me to fulfill my good desires. The Holy Apostle Paul again says: a good will is present with me; but how to perform that which is good I find not (Romans 7:18). And again he exclaims: O wretched man that I am! who shall deliver me from the body of this death? (Romans 7:24). Is this condition not the same as that of the drowning that Christ’s disciples experienced? But, dear brothers and sisters, the following detail from today’s Gospel is worthy of our attention. When the Apostle Peter asked the Lord’s permission to come to Him on the water, and the Lord permitted him, the Apostle left the boat and walked on the sea as on dry land; the waves did not hinder him and his feet did not sink. But when he saw the wind boisterous, he was afraid; and beginning to sink, he cried, saying, Lord, save me. And immediately Jesus stretched forth His hand, and caught him, and said unto him, O thou of little faith, wherefore didst thou doubt? (Matthew 14:30-31). This means that if he had not doubted and feared, he would have freely reached the Lord; however, lack of faith deprived him of grace-filled strength. But when he called out for help, the Lord upheld him, not allowing him to plunge into the depths. Therefore, my dear ones, let us never forget this when it becomes our lot to bear sorrows. We may undergo very grievous sorrows, but no matter how grievous they may be, we should never succumb to despondency; we should not think that life is bleak and that there is no way out. Believe firmly that in misfortunes the Lord is near us. Since the Lord himself experienced such sorrows under the weight of His Cross, will He not comfort us in the sorrows that we undergo? He controls everything, sees everyone, and grants blessedness for the tears of all. Just endure your misfortunes, hoping in God, and your sorrow shall be turned into joy (John 16:20). After the gloom of night there always comes the rising of the sun; following a storm there comes a time of comforting peace and pleasant calm. If there are tears, there will also be joy. If you have not known bitterness, you will not recognize sweetness. “This is not your home,” the monk replied. “Because the enemies, who hate faith and virtue, dare mock the Lord’s servant,” replied the monk. “You yourself are guilty,” retorted the heavenly voice, “since you had forgotten Me. You yourself see that, when you called upon Me, I was quick to help. The Elder, having perceived God’s power, fell upon the ground. My dear ones, let us give thanks to the Lord for His Divine love for us, for His care for the whole Church and for each one of us, and for the fact that He saves us from drowning. Let us pray to Him from our soul with love: “Lord, Thou art our Creator, Savior, and Redeemer. Thou art our quiet sailing, our miraculous Helmsman, and our secure dock. Thou hast always appeared to us when we have been hit by storms. 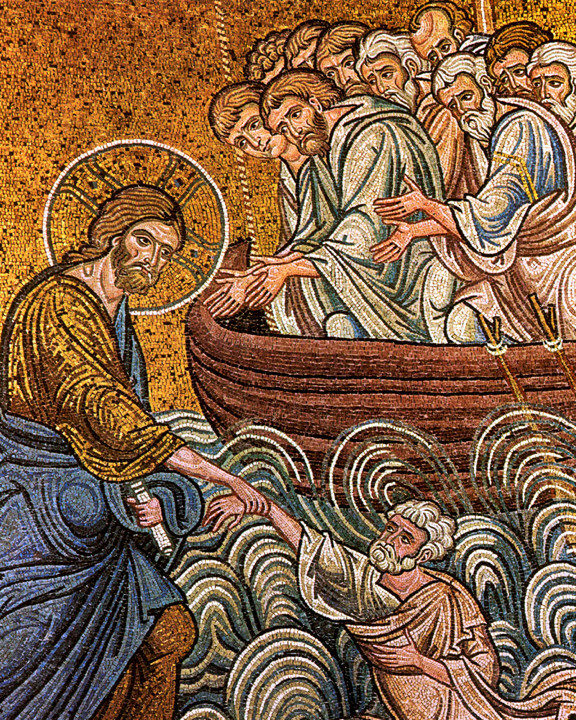 Teach us to come to Thee with faith, undeterred by the turbulent passage of this life with all its dangers; in moments of need stretch out Thy helping hand, as Thou didst to Peter when he was drowning. If it please Thee to send us temptations, then confirm and strengthen our weak powers to battle with them, that we might not fall under their weight and lose Thy Kingdom, prepared for those who have loved Thee from the creation of the world.” Amen.